The wing leading edges, or leading edge slats, and horizontal and vertical stabilizer leading edges of many aircraft make and models have anti-icing systems installed to prevent the formation of ice on these components. The most common anti-icing systems used are thermal pneumatic, thermal electric, and chemical. Most general aviation (GA) aircraft equipped to fly in icing conditions use pneumatic deicing boots, a chemical anti-ice system. High-performance aircraft may have “weeping wings.” Large transport-category aircraft are equipped with advanced thermal pneumatic or thermal electric anti-icing systems that are controlled automatically to prevent the formation of ice. Thermal systems used for the purpose of preventing the formation of ice or for deicing airfoil leading edges usually use heated air ducted spanwise along the inside of the leading edge of the airfoil and distributed around its inner surface. These thermal pneumatic anti-icing systems are used for wings, leading edge slats, horizontal and vertical stabilizers, engine inlets, and more. There are several sources of heated air, including hot air bled from the turbine compressor, engine exhaust heat exchangers, and ram air heated by a combustion heater. 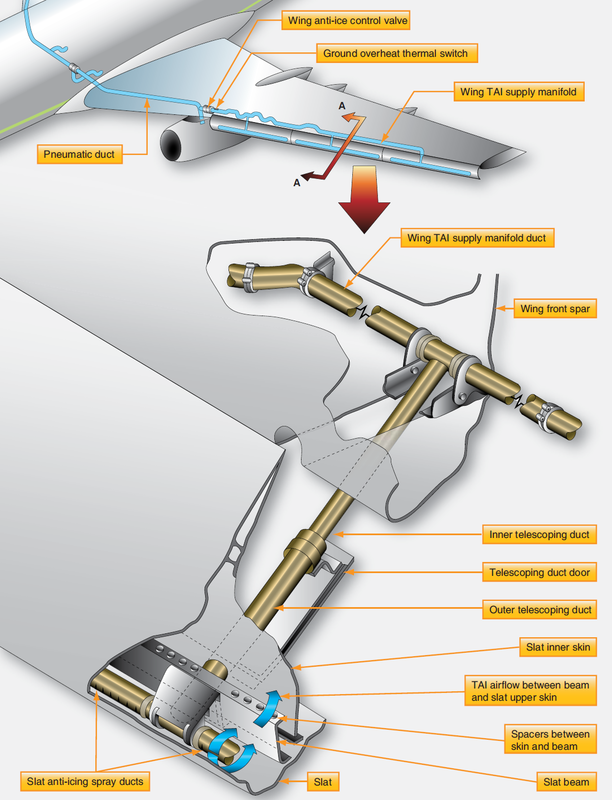 Thermal wing anti-ice (WAI or TAI) systems for business jet and large-transport category aircraft typically use hot air bled from the engine compressor. Relatively large amounts of very hot air can be bled off the compressor, providing a satisfactory source of anti-icing heat. The hot air is routed through ducting, manifolds, and valves to components that need to be anti-iced. 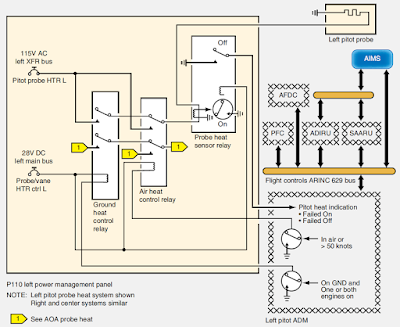 Figure 1 shows a typical WAI system schematic for a business jet. The bleed air is routed to each wing leading edge by an ejector in each wing inboard area. The ejector discharges the bleed air into piccolo tubes for distribution along the leading edge. Fresh ambient air is introduced into the wing leading edge by two flush-mounted ram air scoops in each wing leading edge, one at the wing root and one near the wingtip. The ejectors entrain ambient air, reduce the temperature of the bleed air, and increase the mass airflow in the piccolo tubes. The wing leading edge is constructed of two skin layers separated by a narrow passageway. 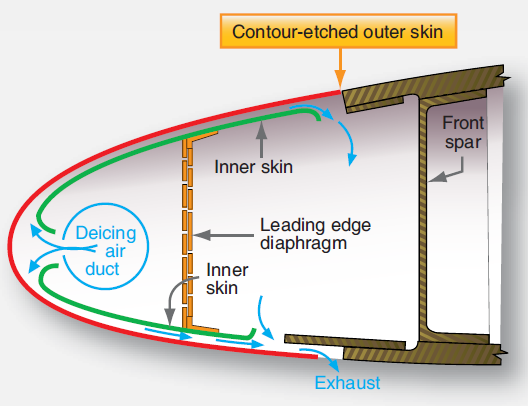 [Figure 2] The air directed against the leading edge can only escape through the passageway, after which it is vented overboard through a vent in the bottom of the wingtip. When the WAI switch is turned on, the pressure regulator is energized and the shutoff valve opens. When the wing leading edge temperature reaches approximately +140 °F, temperature switches turn on the operation light above the switch. If the temperature in the wing leading edge exceeds approximately +212 °F (outboard) or +350 °F (inboard), the red WING OV HT warning light on the annunciator panel illuminates. The ducting of WAI systems usually consists of aluminum alloy, titanium, stainless steel, or molded fiberglass tubes. The tube, or duct, sections are attached to each other by bolted end flanges or by band-type V-clamps. The ducting is lagged with a fire-resistant, heat-insulating material, such as fiberglass. In some installations, thin stainless steel expansion bellows are used. Bellows are located at strategic positions to absorb any distortion or expansion of the ducting that may occur due to temperature variations. The joined sections of ducting are hermetically sealed by sealing rings. These seals are fitted into annular recesses in the duct joint faces. When installing a section of duct, make certain that the seal bears evenly against and is compressed by the adjacent joint’s flange. When specified, the ducts should be pressure tested at the pressure recommended by the manufacturer of the aircraft concerned. Leak checks are made to detect defects in the duct that would permit the escape of heated air. 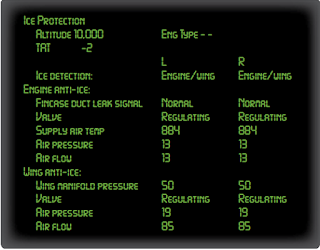 The rate of leakage at a given pressure should not exceed that recommended in the aircraft maintenance manual. Air leaks can often be detected audibly and are sometimes revealed by holes in the lagging or thermal insulation material. However, if difficulty arises in locating leaks, a soap-and water solution may be used. All ducting should be inspected for security, general condition, or distortion. Lagging or insulating blankets must be checked for security and must be free of flammable fluids, such as oil or hydraulic fluid. Aircraft that utilize leading edge slats often use bleed air from the engine compressor to prevent the formation of frost on these surfaces. On a modern transport category aircraft, the pneumatic system supplies bleed air for this purpose. WAI valves control the air flow from the pneumatic system to WAI ducts. The WAI ducts carry the air to the slats. Holes in the bottom of each slat let the air out. The WAI pressure sensor senses the air pressure in the WAI duct after the WAI valve. 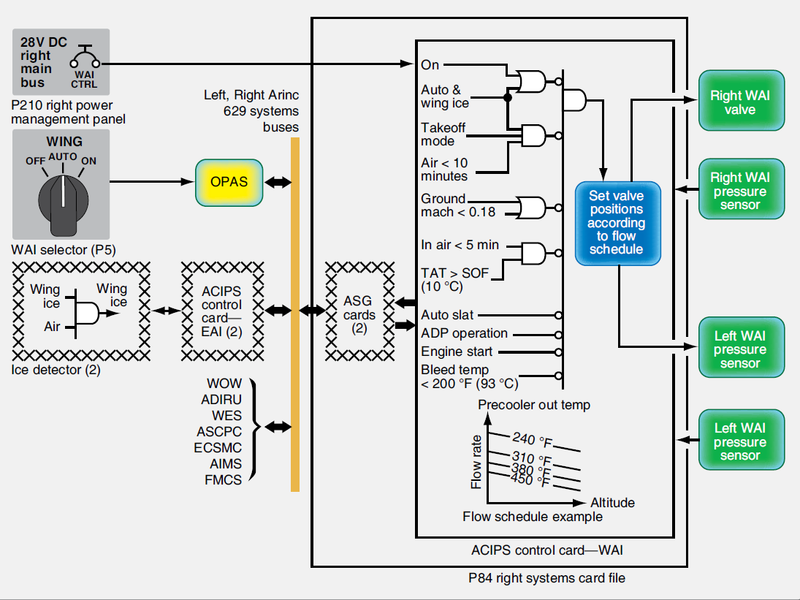 The ACIPS system card uses the pressure information to control the WAI system. Modern aircraft use several onboard computers to control aircraft systems. The WAI system is controlled by the ACIPS computer card. The ACIPS computer card controls both WAI valves. 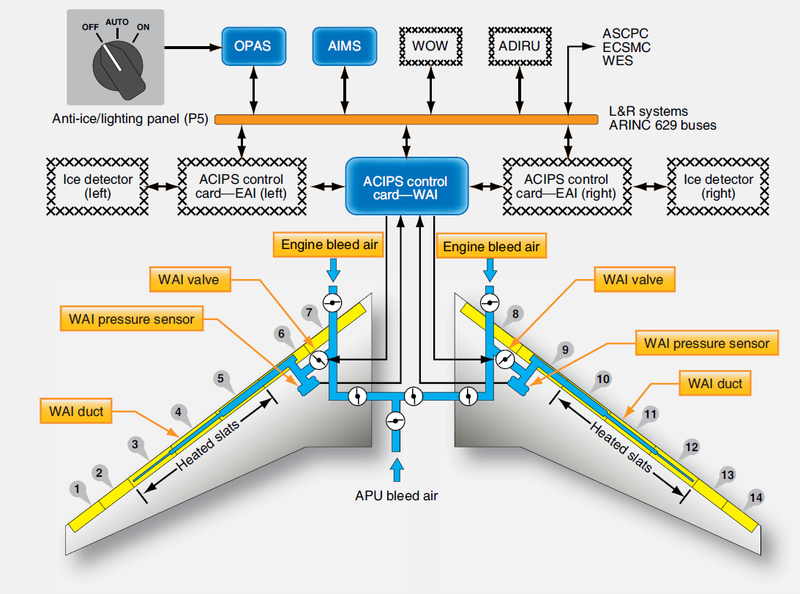 The required positions of the WAI valves change as bleed air temperature and altitude change. The left and right valves operate at the same time to heat both wings equally. This keeps the airplane aerodynamically stable in icing conditions. 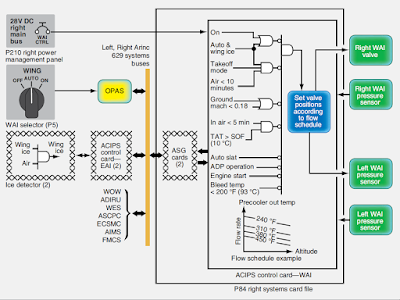 The WAI pressure sensors supply feedback information to the WAI ACIPS computer card for WAI valve control and position indication. If either pressure sensor fails, the WAI ACIPS computer card sets the related WAI valve to either fully open or fully closed. If either valve fails closed, the WAI computer card keeps the other valve closed. Bleed air temperature less than 200 °F (93 °C). The WAI valves stay closed as long as the operational mode inhibit is active. 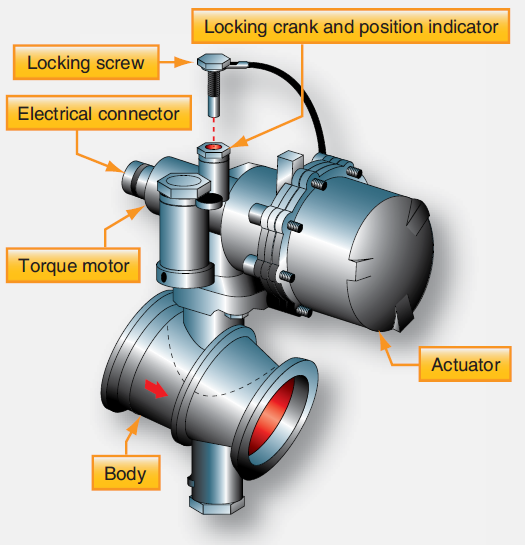 If the valves are already open, the operational mode inhibit causes the valves to close. BITE circuits in the WAI ACIPS computer card continuously monitor the WAI system. Faults that affect the dispatch of the aircraft cause status messages. Other faults cause central maintenance computer system (CMCS) maintenance messages. The BITE in the WAI ACIPS computer card also performs automatic power-up and periodic tests. Faults found during these tests that affect dispatch cause status messages. Other faults cause CMCS maintenance messages. The power-up test occurs when the card gets power. BITE does a test of the card hardware and software functions and the valve and pressure sensor interfaces. The valves do not move during this test. The airplane has been on the ground between 1 and 5 minutes. The WAI selector is set to auto or on. Air-driven hydraulic pumps are not in intermittent operation. Bleed pressure is sufficient to open the WAI valves. The time since the last periodic test is more than 24 hours. During this test, the WAI valves cycle open and closed. This test makes sure that valve malfunctions are detected. Electricity is used to heat various components on an aircraft so that ice does not form. This type of anti-ice is typically limited to small components due to high amperage draw. Effective thermal electric anti-ice is used on most air data probes, such as pitot tubes, static air ports, TAT and AOA probes, ice detectors, and engine P2/T2 sensors. Water lines, waste water drains, and some turboprop inlet cowls are also heated with electricity to prevent ice from forming. Transport category and high performance aircraft use thermal electric anti-icing in windshields. In devices that use thermal electric anti-ice, current flows through an integral conductive element that produces heat. The temperature of the component is elevated above the freezing point of water so ice cannot form. Various schemes are used, such as an internal coil wire, externally wrapped blankets or tapes, as well as conductive films and heated gaskets. A basic discussion of probe heat follows. Windshield heat and portable water heat anti-ice are discussed in aircraft windshield frost, fog, and ice control systems and portable water tank ice prevention. Propeller deice boots, which also are used for antiice, are also thermal electric and discussed in propeller deice system. Data probes that protrude into the ambient airstream are particularly susceptible to ice formation in flight. Figure 8 illustrates the types and location probes that use thermal electric heat on one airliner. A pitot tube, for example, contains an internal electric element that is controlled by a switch in the cockpit. Use caution checking the function of the pitot heat when the aircraft is on the ground. The tube gets extremely hot since it must keep ice from forming at altitude in temperatures near -50 °F at speeds possibly over 500 miles per hour. An ammeter or load meter in the circuit can be used as a substitute to touching the probe, if so equipped. 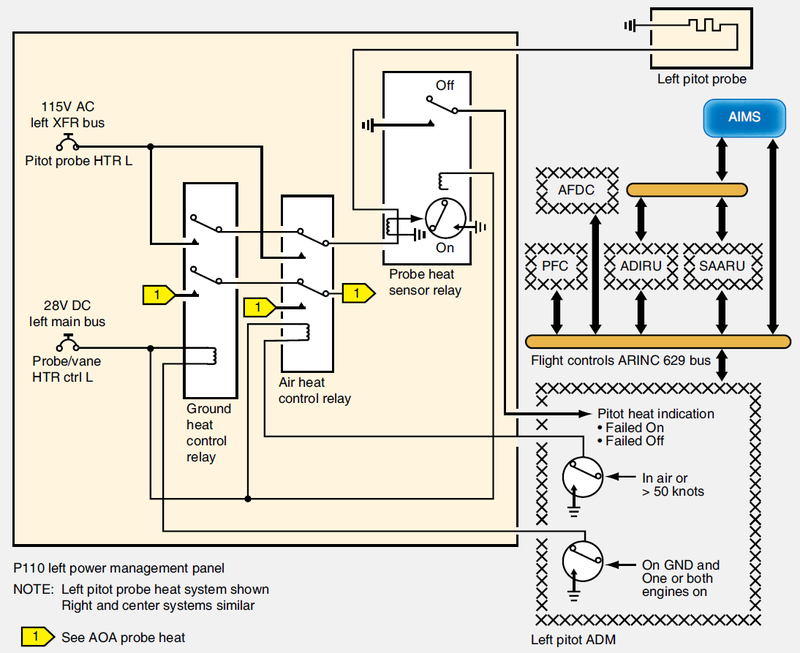 Simple probe heat circuits exist on GA aircraft with a switch and a circuit breaker to activate and protect the device. 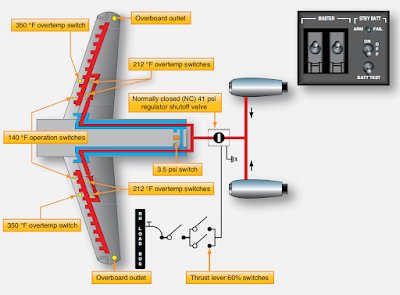 Advanced aircraft may have more complex circuitry in which control is by computer and flight condition of the aircraft is considered before thermal electric heaters are activated automatically. Figure 9 shows such a circuit for a pitot tube. The primary flight computer (PFC) supplies signals for the air data card (ADC) to energize ground and air heat control relays to activate probe heat. 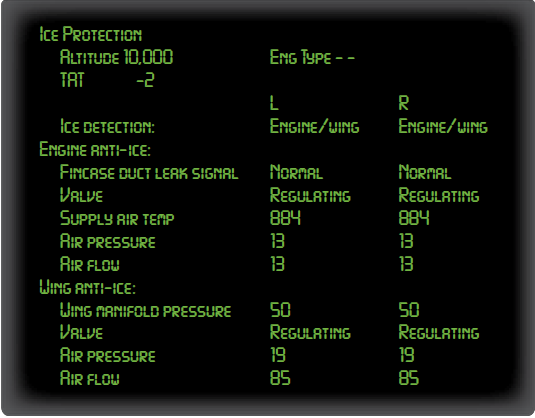 Information concerning speed of the aircraft, whether it is in the air or on the ground, and if the engines are running are factors considered by the ADC logic. Similar control is use for other probe heaters. Chemical anti-icing is used in some aircraft to anti-ice the leading edges of the wing, stabilizers, windshields, and propellers. 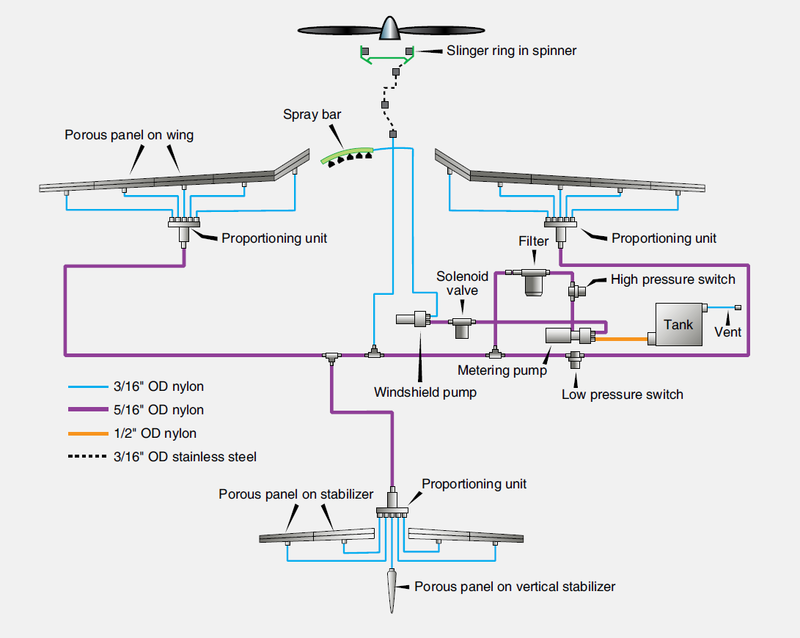 The wing and stabilizer systems are often called weeping wing systems or are known by their trade name of TKS™ systems. Ice protection is based upon the freezing point depressant concept. An antifreeze solution is pumped from a reservoir through a mesh screen embedded in the leading edges of the wings and stabilizers. Activated by a switch in the cockpit, the liquid flows over the wing and tail surfaces, preventing the formation of ice as it flows. The solution mixes with the supercooled water in the cloud, depresses its freezing point, and allows the mixture to flow off of the aircraft without freezing. The system is designed to anti-ice, but it is also capable of deicing an aircraft as well. When ice has accumulated on the leading edges, the antifreeze solution chemically breaks down the bond between the ice and airframe. This allows aerodynamic forces to carry the ice away. Thus, the system clears the airframe of accumulated ice before transitioning to anti-ice protection. Figure 10 shows a chemical anti-ice system. The TKS™ weeping wing system contains formed titanium panels that are laser drilled with over 800 tiny holes (.0025 inch diameter) per square inch. These are mated with nonperforated stainless steel rear panels and bonded to wing and stabilizer leading edges. As fluid is delivered from a central reservoir and pump, it seeps through the holes. Aerodynamic forces cause the fluid to coat the upper and lower surfaces of the airfoil. The glycol based fluid prevents ice from adhering to the aircraft structure. Some aircraft with weeping wing systems are certified to fly into known icing conditions. Others use it as a hedge against unexpected ice encountered in flight. The systems are basically the same. Reservoir capacity permits 1- 2 hours of operation. TKSTM weeping wings are used primarily on reciprocating aircraft that lack a supply of warm bleed air for the installation of a thermal anti-ice system. 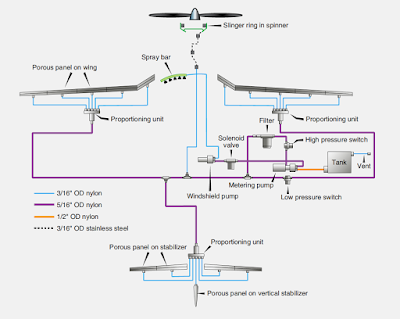 However, the system is simple and effective leading to its use on some turbine powered corporate aircraft as well.